Arrow – click to group subtools below the selected one. The word START will be shown, and the number of subtools. Clicking START will hide/show the group. (See Auto Collapse button below.) To delete the group click the arrow. Groups are not nested so creating or deleting a group below an existing one will adjusting the numbering. 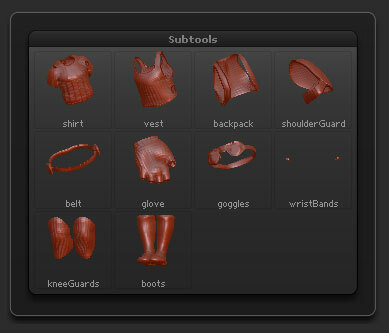 If subtools are grouped and the Auto Collapse button is on then each group will be collapsed automatically. Copy the selected subtool into memory. Paste a subtool from memory.